A young Iranian couple have been arrested after a marriage proposal in public, captured on a video clip that went viral on social media. The police say the pair offended Islamic mores on public decency but were later released on bail. 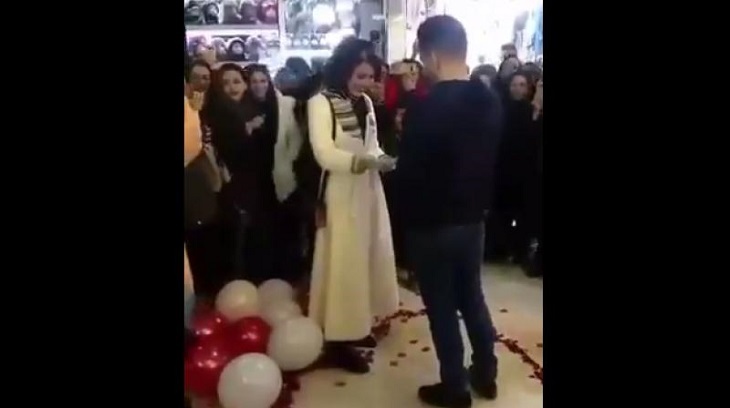 The video, which spread on social media last Friday, shows the young man standing in a heart-shaped ring of flower petals next to colorful balloons in a mall in the central city of Arak. After the young woman says "yes," he slips a ring on her finger to cheers from onlookers. The two weren't identified. Mostafa Norouzi, deputy police chief in Arak, told the Shahrvand daily that it's unacceptable for the young "to do whatever is common in other places of the world and disregard mores, culture and religion."